There he goes again! Carlos named the sexiest man at 44 by People Magazine!! But a question remains unresolved -oh btw this is not the only one ... but let’ s get back to the subject at hand – so the question is : What happened between 2003 and 2006?! Let me guess, the magazine didn’t exist anymore or it didn't published any ranking?! ... This is the only conceivable answer to me. About his future plans, nothing new. He just says that he could maybe have a new pilot for Fox, but nothing is sure yet; obviously he is talking about Mission Road even if he doesn't mention it. At the question about his fans, we learn that "LA people don't bother you too much ... it's when you go to Napperville IL, that' s where you get trouble ... but people in LA are pretty cool"
I've just added the pics of Carlos last appearance in the gallery! Click on the image below to check'em out! According to Variety, Warner Bros. has hired Phil Joanou (upcoming Gridiron Gang) to direct its remake of cop actioner Sharky's Machine and set it up with Basil Iwanyk's Thunder Road to produce. The film is a potential starring vehicle for Mark Wahlberg, who is executive producing with Stephen Levinson for Leverage Management. Burt Reynolds directed and toplined the 1981 Warners film, based on the novel by William Diehl. The new version will vary in places from the original and likely won't be set in Atlanta. The story revolves around a tough homicide cop who is demoted to the lowest of the low, the morals squad. He rallies together a ragtag group of cops who successfully take down a man who rigs elections. Jerry Stahl wrote the script. Screenwriters Doug Miro and Carlos Bernard have done a rewrite. Wanna watch the video of Carlos Bernard interviewed on set of "24" a few days ago? Parts of this video aired on the last week on Fox news but most of this video didn't air on the show... So, if you missed it on TV or if you want to see the whole video of this interview, click here. -Why did Carlos stay in the background like that? Ok, since his character was supposed to be "died", it was pretty surprising to see him on the set of 24 again. But because anyway it has always been a pleasure to see him , it would have been great if he could have talked more. It was a pity he seemed to be there only to go with John Cassar. Seriously, Carlos was the hotest, the funniest and the most interesting guy of this set (and actually not only of the set ) , he should have been put on the spotlight! - Why does John Cassar himself underline that because of the silent clock's lack for Tony, a lot of fans believe that Tony is alive? By the way, that point and the "Tony is "died"" expression shows once again that they are very aware of what happens on the 24 forums and especially on the Fox one. I don't know who is used to checking the fans' posts, but I'm sorry to tell you this is not Carlos. Indeed, except if he has followed my advice ( actually I told him that he should go more often on the internet because it would be a great ego boost ), he is not used to going online very often. And a last question... why does this tee-shirt ring a bell? 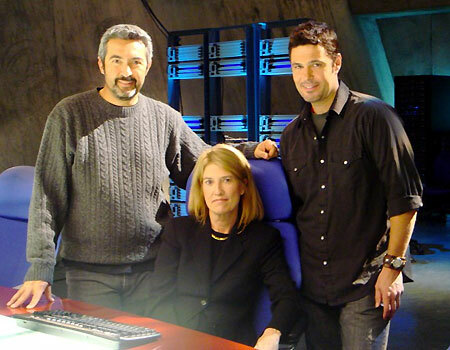 Last week, Carlos was with John Cassar on the set of 24 to be interviewed by Greta Van Susteren. It was aired on Fox on thursday night. Disturbing details: -Carlos who is not supposed to be working for 24 anymore (remember the death of Tony Almeida... ) and who is nevertheless the one who goes with John Cassar, the executive producer/director to answer an interview on the set of 24. -John Cassar who mentions that they didn't give Tony a silent clock and the smirk of Carlos at the same moment (to say nothing of all the other references to the "alleged" death of Tony). -And finally, the article of Greta Van Susteren who writes, "yes, Tony is "died"". Are they trying to make us believe that Tony could be alive? :-|We don't know what to expect with this show, that is for sure; but what about them? Do they know when the audience will be fed up with the unbelievable twists? Feel free to come on the forum to give your opinion about this interview!